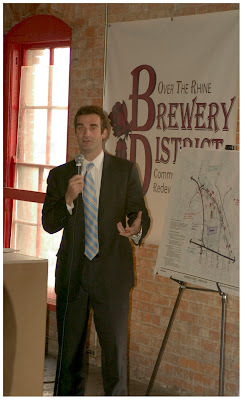 Last Friday, April 11th was a great day for Over-the-Rhine, and especially the Brewery District. There was the debut of a new Ohio Historical Marker for the Brewery District...and the Clyffside building kicked off its renovation process with a 'wall knocking' by council members Chris Bortz and Roxanne Qualls. Brewery District people spoke, the two council members, and many others saw this as a chance to voice their support for the Cincinnati Streetcar. At one point the audience was instructed to look out the window and notice where the northern end of the Streetcar will eventually be (1.5 blocks away or so). Needless to say, people were excited about the historical honor and the announcement of a renovation project that will bring 19 new units to OTR ranging from the low-100's to the mid-200's. Oh yeah, and the free Christian Moerlein was great too. 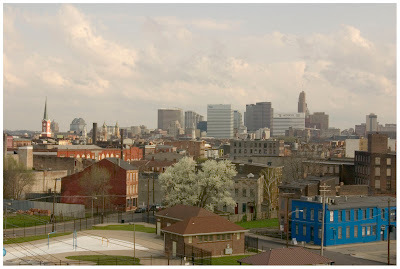 Over-the-Rhine certainly has some serious momentum that it hasn't had for a long, long time. Speculation is already occurring along the proposed streetcar route and the neighborhood's rich history is starting to get the recognition it deserves. To that I say cheers, over a Christian Moerlein OTR Ale. You can view the rest of my photos from the Clyffside ribbon cutting, historical marker, and building tour HERE. This project is going to be spectacular. I can't wait to see it finished. I have a friend who is very interested in purchasing. He currently lives in Mariemont. Count one more for the city! I heard it was great. There is so much history in this town.